I want to know if there are any kinds of solar panels that can be produced completely locally, from gathering materials to manufacturing to installing, without fossil fuel inputs anywhere in the process. Are there any kinds of electricity-generating solar panels that meet these requirements? Any references to people who have tried to do this would be appreciated. All the DIY references I’ve found still require buying components that are dependent on fossil fuel-driven manufacturing and mining processes. Thanks! Edit: Thanks for the responses! Local does mean wherever I am, in my town or surrounding towns (say, a 15 mile radius). I'm not talking about any particular location, so I'm interested in solar panels that can be made from materials widely available around the country. The purpose of the question is to determine whether solar panels can be made after fossil fuels are widely unavailable and long-distance supply chains are extremely expensive or unavailable. The purpose of the question is to determine whether solar panels can be made after fossil fuels are widely unavailable and long-distance supply chains are extremely expensive or unavailable. I won't address the assumptions made re unavailability of supply chain, and will just assume that it is true in this case. Numerous semiconductor material exist. Many of these are suitable to some extent for making "solar cells" but practical considerations usually result in extremely low efficiencies - typically far far below 1%. One material that would be available in moderate quantities s a byproduct of past applications would be Copper, and in some areas copper could be smelted locally. "Copper Oxide" (of which there are a number of forms) is a semiconductor and solar cells can be made from it. Efficiencies and power levels are usually 'pitiful' but researchers continue to improve results and it is possible that in time a product may be avail;able which is not as efficient as Silicon, but which is low enough in cost as to make the cells competitive in some cases. Link - This 2006 paper - full version available here for free - "Heterojunction solar cell with 2% efficiency based on a Cu2O substrate" claims 2% conversion efficiency and a current output of 6.8 mA per cm^2 short circuit at about 0.6V per cell open circuit. The "fill factor" is about 50% which means that the output droops under load such that the cell makes about 50% x Voc x Isc. The 2% efficiency is about 10%- - 12% of typical top end commercial silicon cells and about 9% of the best silicon cells. That's an encouraging figure if replicable. They seem to be using some high tech fabrication gear (ion beam sputtering) but easier methods can probably be evolved. 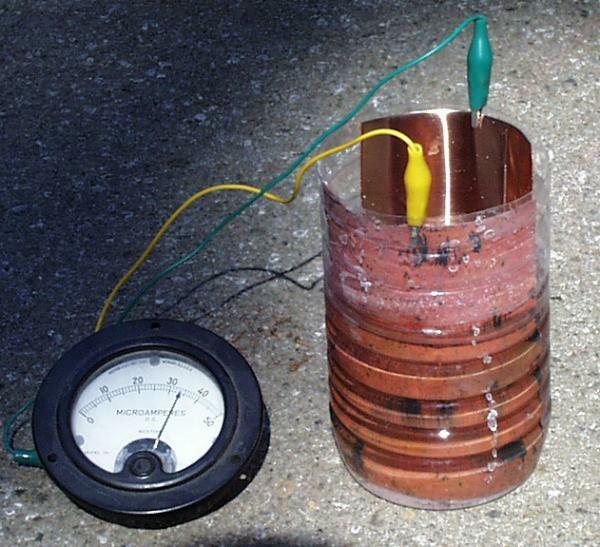 You can produce your own "DIY" cells starting with not much more than copper metal. Results are very poor but they do work. A different version of the above. But saying where "locally" is would help. Requiring 'non-fossil' mining and transport etc is a matter of economics and choice. ie you can mine by hand - and in some countries this is what is indeed often done.Doing this would not be deemed economic in almost any system. This does not mean that it should not be done - just that you need to establish what you are trying to achieve and what the values and costs are. The most common solar panels use a sandwich of glass + bonder + silicon PV cells + bonder + backsheet. The bonder is usually "EVA" plastic which is crosslinked into long chains under temperature and pressure. EVA is a hydrocarbon product but others are possible and a non hydrocarbon alternative is possible. BUT EVA is exceptionally good at this task and in the last 50years or so no better alternative has managed to displace it. There are many challengers. Most people buy doped silicon wafers - which have been made from silica sand using highly advanced metalurgical processes. There is no obvious reason why this whole process could not be hyrdrocarbon free (except perhaps trace chemicals used in the doping processes. but maybe not even then. The glass used is rather special BUT any glass making process that can make an essentially flat smooth sheet would be able to make panels that worked. The backsheet can be glass if desired. Frames are usually aluminum but other materials could be used. Overall it's doable but hard and cost would be very high. Other processes probably have no portion which absolutely must use hydrocarbons EXCEPT if they are used as dopants in the semiconductors. The line "All the DIY references I’ve found still require buying components that are dependent on fossil fuel-driven manufacturing and mining processes." makes it sound like you are hoping to build a solar cell with materials you pick up off the ground. Fortunately, there is such a cell. 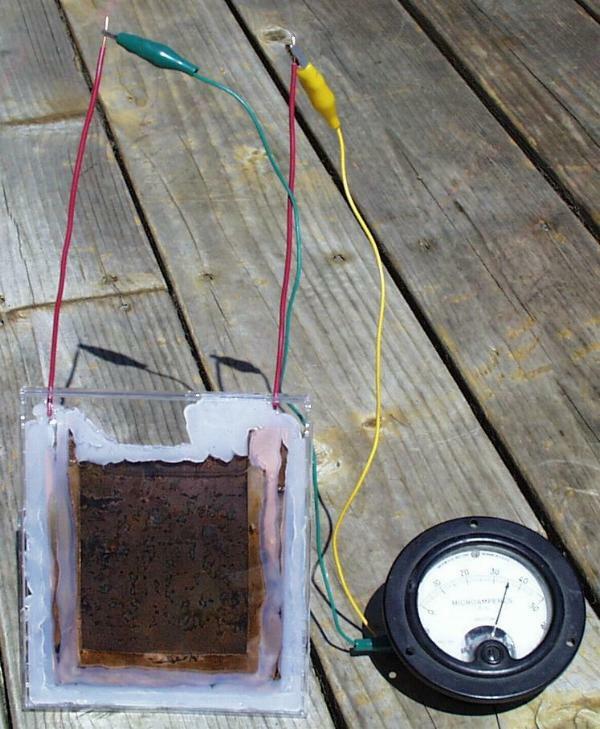 You can make Cuprous oxide solar cells using nothing but copper, heat, and salt water. However, they are not practical for power generation on any serious scale. They produce very little current, and at least in the linked example, require a wet cell for one contact. You would have to make the wet cell container out of something, but assuming you are near a source of salt water, there may be beach sand to melt into glass. Since you're not using fossil fuels to heat the copper or melt the sand, might I suggest chopping down and burning a lot of trees? They are about the only cells I'm aware of that can be produced somewhere where there is native copper available, with minimal energy input. You would still have to smelt the copper, but that doesn't exactly require fossil fuels, so much as it is made easier by them. Dye-sensetised solar cells are probably the best bet, but that still requires ITO glass. At least it doesn't require silicon wafers, cadmium, or anything aggresively toxic. It's likely that in the future those parts of the chemical industry that use FF inputs will start running off biological hydrocarbon inputs. There's no reason why you can't do metal refining with charcoal, the way it used to be done - other than the difficulties of obtaining and transporting enough charcoal. Not the answer you're looking for? Browse other questions tagged solar-power diy localisation or ask your own question.